i don't have many information about this plant, just that my father-in-law brought it from the philippines. 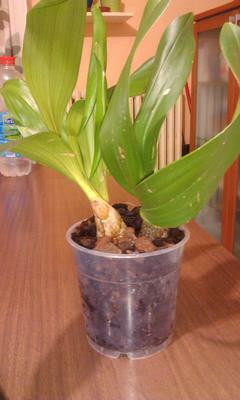 it seems to have pseudobulbs and each of them has three leaves. any luck understanding what type of orchid it is? I'm not sure what kind of orchid it is, either!. The foliage doesn't look familiar. Are the leaves stiff, or thin and kind of floppy? Probably it will be hard to know until it blooms. I would guess that you could grow it like Phalaenopsis in most respects (intermediate-to-warm, just approaching dryness between waterings), except I'm not sure what light level it will like. Go ahead and post photos when it blooms, maybe I'll recognize it! i am an orchid lover myelf and i already own 3 Phalaenopsis. to answer your question regarding the leaves i can say that they are stiff not mushy, it is a healthy, properly watered plant. Phalaenopsis does not have pseudobulbs,this on does. 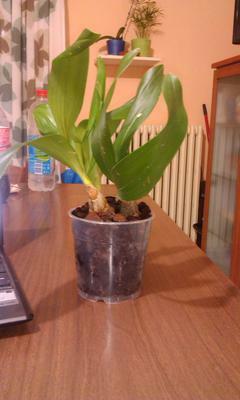 it looks like an weird cattleya.